One of the most amazing ideas I saw at Convention, and adored, was a very, very clever way to use the umbrella in Rue Des Fleurs as a dress! Now, I’m so sorry, I don’t know who to credit for this amazing dress. There could be others out there on the internet, but my inspiration came from the very clever demo who displayed her work at Convention in Canberra – and the project was amazing too! If anyone can tell who this lady was or provide a link for my inspiration, please do! 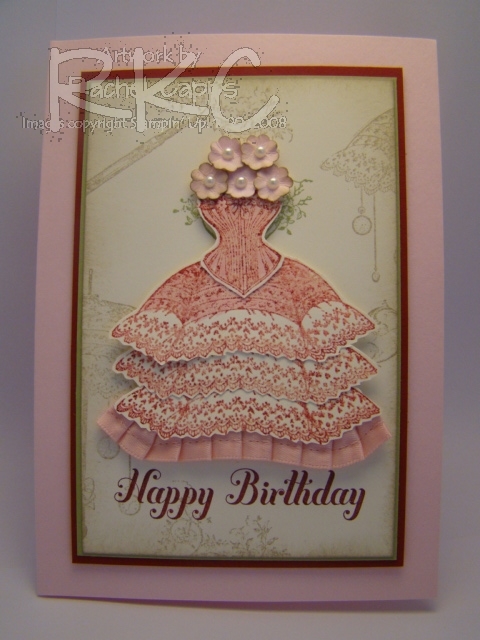 I made this card slightly different to the one I saw at Convention (it was embossed in gold and coloured with Cherry Cobbler), but this card was for a good friend’s daughter, who is turning 10, so more pink was appropriate! I embossed the image using clear Versamark, inking in Cherry Cobbler and then the Cherry scented Embossing Powder – so this project has a YUMMY smell 🙂 I coloured in some of the embossed image with my Pink Pirouette market. 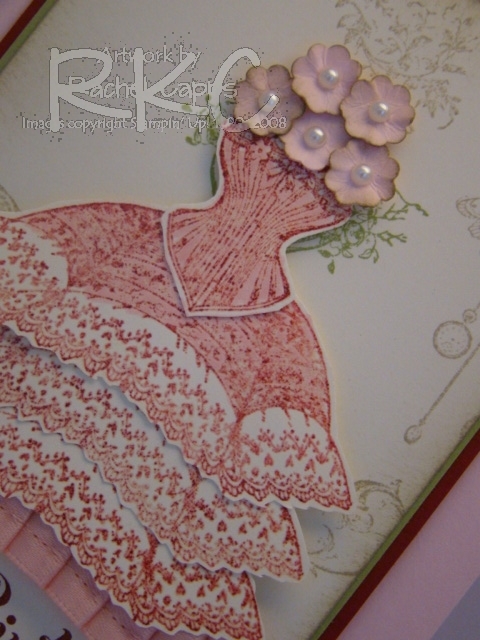 I used the stamp sets, Rue Des Fleurs and the sentiment from Bring on the Cake. I’ve used the colour combination Cherry Cobbler, Pink Pirouette, Crumb Cake, Very Vanilla and Pear Pizzazz. The itty bitty flower shapes punch was perfect for the flowers, which I scrunched up and sponged before popping a pearl on each flower. 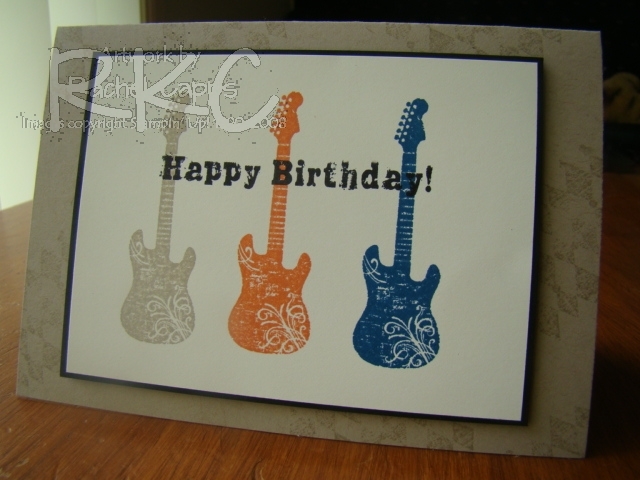 A little sponging the Very Vanilla edge finished off the card! Now that you’ve seen an alternative use for this stamp set – don’t you feel justified in wanting to buy it (if you haven’t already!). If you really want it, because you’ve been inspired like I was inspired, you can see more than one use for this lovely stamp set, and you live in Australia, simply email me at rachel.capps@yahoo.com.au, mention this post by saying “you feel justified”, place your order with me for this stamp set at $42.94 (clear mount) or $53.95 (wood mount) and I will arrange for it to be shipped to you, where ever you want (home or work), for FREE. This is a once-only offer which ends with the Autumn-Winter Mini Catalogue on 31 July 2012. 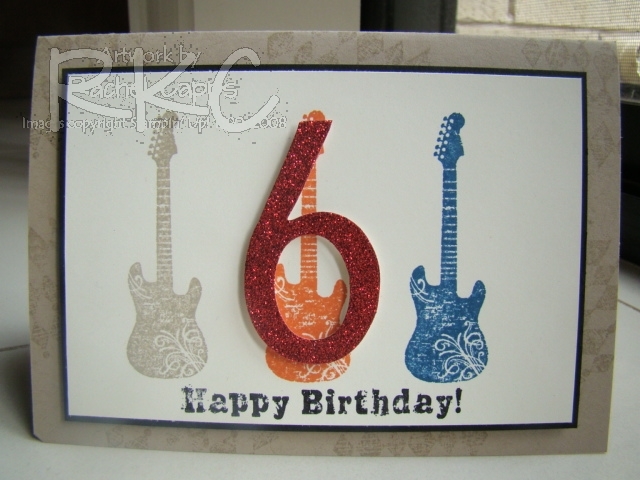 This is a card I made for a gorgeous gal in our family who turned 18 earlier this year. I know that the key is meant to be for a 21st, but I just had received the Trinket Keys in a recent order, and I couldn’t help use it! 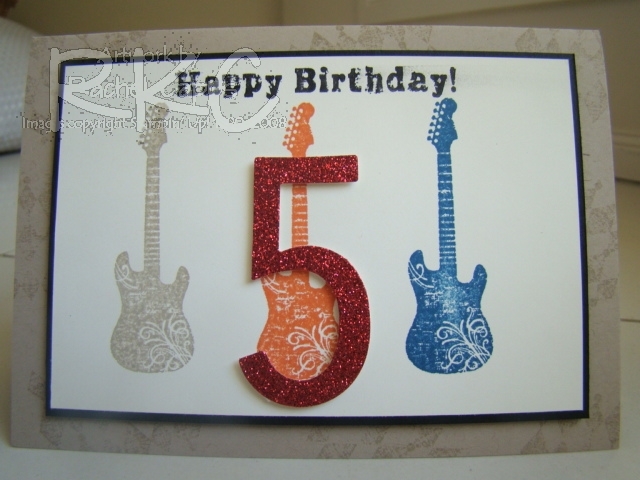 And then, with Sale-a-bration, I also had the stamp set Elementary Elegance, so again, the key theme had to happen! 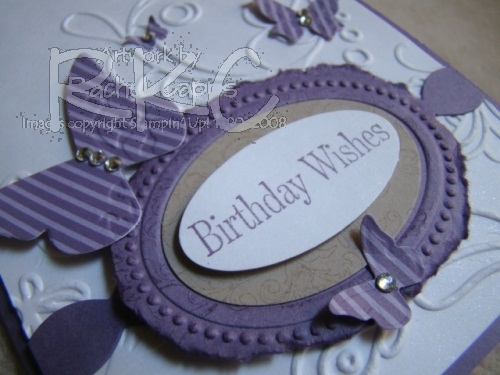 I stamped the key from Elementary Elegance in Whisper White craft ink on the crumb cake cardstock. I stamped the frame in the same ink and then heat embossed it with White embossing powder. 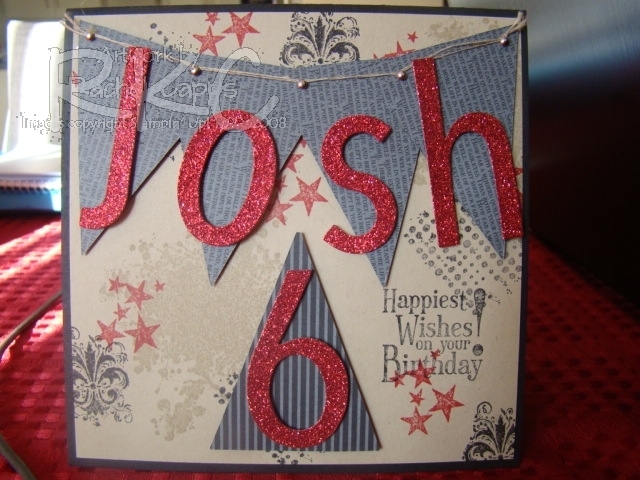 I cut out the “18” with the Big Shot and Simple Numbers Bigz Die in Red Glitter paper and also the Scallop Square Duo Bigz Die for the layered background of the “18”. The Trinket Key is hung from the Red Satin ribbon with Cherry Cobbler Baker’s Twine. So I’m a little late with the Sale-a-bration cards, but I did make a few! I’ll pop them up over the next few days. 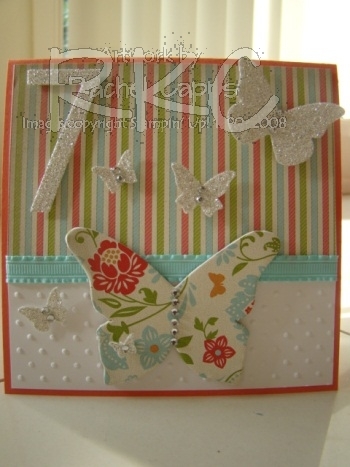 For this card, I used the Everyday Enchantment DSP, the stripes and the flowers on the butterfly. I used the Big Shot to cut the big butterfly from the Beautiful Butterflies Bigz Die and the little butterflies from the Beautiful Wings Embosslits Die. And the Simple Numbers Bigz Die for the number 7. 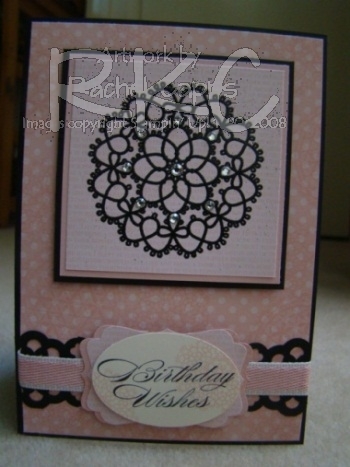 Plus I used the Perfect Polka Dots embossing folder on the bottom strip of Whisper White paper. I added the Pool Party ruffled ribbon and was more than pleasantly surprised at how PRETTY this ribbon really is. I love it! And what little girl’s card wouldn’t be complete without some Rhinestone jewels? This is a card I made for my gorgeous cousin’s daughter last year. 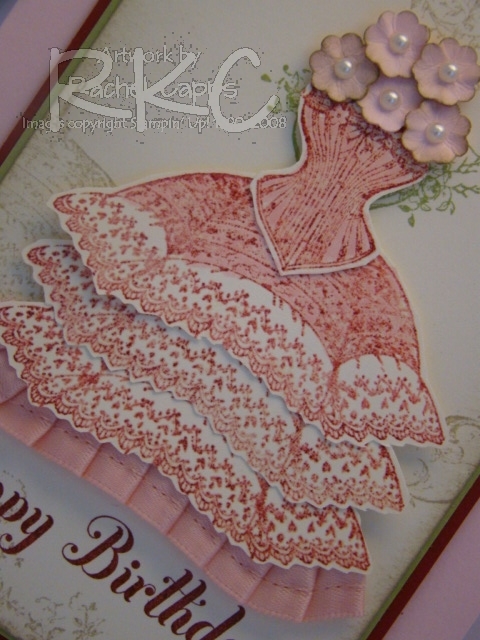 I just love this card – it’s one of my favourites! I’ve used the colours Shimmery White, Perfect Plum and Crumb Cake. 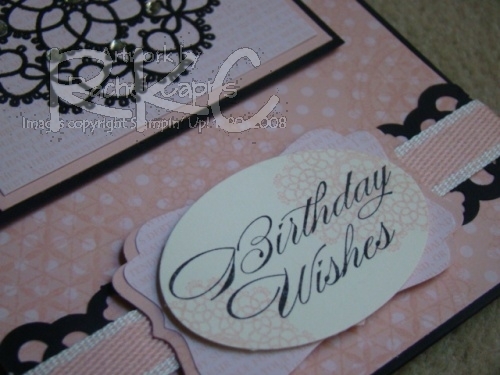 Then I’ve used the Big Shot lots – I started with the Elegant Lines embossing folder for the Whisper White background, then I used the Designer Frames embossing folder for the sentiment. The sentiment was stamped from the now retired Occasional Quotes and punched out with the Large Oval punch and and layered with the Extra-Large Oval punch. 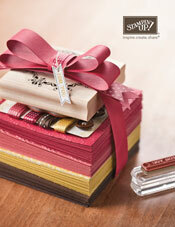 Intead of ribbon, I’ve used the Tasteful Trim Big XL die (love this die!). 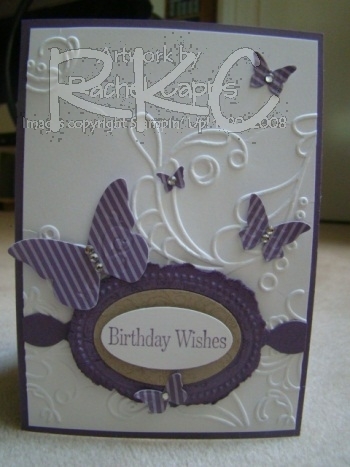 Lastly, I used the Beautiful Wings embosslits die for the stunning butterflies with Perfect Plum Subtles Collection Patterns DSP paper stack. This is a close up of the sentiment and if you look closely you can see that I’ve stamped the layers behind the sentiment with the ever-so pretty Elizabeth stamp stamped in Crumb Cake ink. The butterflies sparkle with Rhinestone jewels. I just the love Patterns DSP stacks (can’t you tell?) – they’re so versatile!